Aerial Photography in South Africa was established in early 2005. Our wealth of knowledge comes from over 6 years of specializing in property photography throughout South Africa for some of the leading Real Estate and Tourism organizations. It was a natural progression for us. We first started photographing property from ground level and realized the limitations this had. We then developed cost effective solutions to achieve our goals, this is when Aerial Photography South Africa was born. We offer a professional land and aerial based photography service throughout the Western Cape. Our photographers use the latest digital technology from a 12 meter hydraulic mast to a helicopter or a fixed wing aeroplane. We are considered to be one of the best at what we do and we have consistent work from major clients such as Sotheby's Realty, Seeff Properties and Cape Waterfront Estates to name a few. We provide the highest quality photographic imagery attainable, using the latest cutting edge technology. Village and Life is a major property and tourism company. 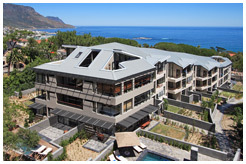 They needed to showcase their latest project "The Glen, Camps Bay" to their clients but could not get a photograph that captured the whole building and the amazing sea views. They approached us with their problem and we suggested we use our elevated pole that remotely captures photographs. The results where amazing! Sotheby's is known for representing extraordinary properties throughout the world. Seeff is a premier South African property and real estate company. Village & Life is a dynamic & innovative hospitality group renowned for its hotels, guest houses and unique Hospitality Villages.